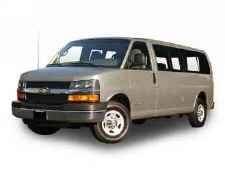 The Chevrolet Express sees a host of duties: as a proven passenger hauler – able to accommodate up to 15 passengers – as the foundation for conversion vans and as a durable and reliable commercial cargo van. As such, Express customers rely on their vehicles to haul and tow items. That task becomes even easier for 2006 with the introduction of the Duramax 6600 turbo-diesel V-8 engine. This sophisticated diesel engine offers more horsepower and torque than the primary competitor, as well as a quieter driving experience and better projected fuel economy. It’s available on G2500 and G3500 series cargo and cutaway models.